Time for another list! We had such fun last time that Moira at Clothesinbooks.com and I have got together again, this time to share our ten favourite books set on the Home Front. Mine are all set in WWII. Here goes . . .
First up is Joyce Dennys’s Henrietta’s War (1983 – but written during the war). This is also on my list of books that make me laugh. I love it – and the second one, Henrietta Sees It Through, is just as good. Dennys was a GP’s wife in Budleigh Salterton, and these are purportedly letters written to her cousin. They are fiction, but I am sure they drew heavily on her own experience. They are charming, witty, and illustrated with her own delightful drawings – and along the way you get a very good idea of what the home front was like on the Devon coast. Penelope Fitzgerald’s Human Voices (1980). 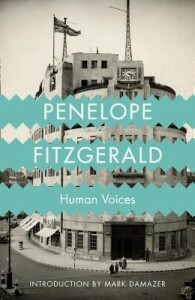 Set in the BBC where Fitzgerald worked herself during the war. Funny, touching, perfectly observed: vintage Fitzgerald. I must reread it – again. Muriel Spark, The Girls of Slender Means (1963). Very short, a novella really, and not a word wasted. It’s 1945 and the girls of slender means live in a London hostel, the May of Teck, with an unexploded bomb in the garden. What happens offers them a glimpse into the heart of darkness that will influence the course of their future lives. I’d love you to review this, Moira. Clothes are very important here. Elizabeth Bowen’s novel The Heat of the Day is her best known work set in WWII, but I would go for The Collected Stories (1980). My copy is falling apart. The section, ‘The War Years’ contains some wonderful stories, including ‘Pink May,’ ‘The Demon Lover,’ and ‘The Happy Autumn Fields.’ No-one is better at describing the sheer strangeness and dislocation of war-time London. Anthony Powell, The Soldier’s Art (1966), the eighth volume in A Dance to the Music of Time. Nick Jenkins joins up, but is too old to see active service, so it is all set in the UK. I have included it really for the part set in the Blitz, one of the saddest and most memorable sections in the whole series. Lissa Evans, Their Finest Hour and a Half (2010), set in a documentary film unit just after Dunkirk. I’ve already blogged about this lovely novel. http://www.christinepoulson.co.uk/category/their-finest-hour-and-a-half/. And now some crime. Laura Wilson’s An Empty Death (2009) is set in London in the Blitz and features DI Ted Stratton. The period detail is spot on. A good, gripping, meaty read. Her earlier novel, Stratton’s War, is also excellent. Margery Allingham, Coroner’s Pidgin (1945). Albert Campion, after a secret mission abroad, stops off in his London flat and immediately gets embroiled in a murder investigation. His efforts to get home to his wife, Amanda, are constantly thwarted and when he does, well, the novel has one of my favourite endings. Rennie Airth’s The Dead of Winter (2009), the third and last of his novels featuring (by now former police inspector) John Madden. A Polish land girl is murdered during the blackout and Madden gets involved because she was working on his farm. I don’t think Airth is as well known as he ought to be. He is a terrific writer. And finally, a true classic: Christiana Brand’s Green for Danger (1945). In August 1944, during the V-1 Doodlebug offensive on London, a patient dies on the operating table after being injured by a flying bomb. A nurse is suspicious, but before she can say why, she dies too. Enter Inspector Cockrill. Pure Golden Age pleasure. That’s it. I can’t wait to see what Moira’s chosen. I’ll add a link when her post is up. Here it is: Clothesinbooks.com/Thursday List- Books About the WW2 Homefront. Fascinating . . .
Great list Chrissie, and just the right amount of crossover with mine. I’d forgotten Human Voices – I worked at the BBC a lot of years later, but apparently nothing had changed since this book, I recognized so much about it. I love Laura Wilson, but haven’t read that one, and must also look up the Rennie Airth. I think put together our two lists would make the perfect reading list…. Yes, I agree. The perfect reading list and I’ll have to get cracking on some of yours. Can’t believe I forgot about N or M?! Yes, books about the Home Front are strangely fascinating, aren’t they? I must try that movie. Interesting to see that you both chose the Henrietta books by Joyce Dennys, and I’m glad you included The Girls of Slender Means – all three are among my favourites. My own list would have to include Good Evening, Mrs Craven, by Mollie Panter-Downes and Vere Hodgson’s war diaries, Few Eggs and No Oranges. I must add these to my reading list – getting longer and longer. Interesting, but I guess not surprising, how many good books by women cover this period. Thank you so much for the lovely mention; I loved the list – so interesting – and this afternoon I took ‘Human voices’ out of the library (I can’t believe that I haven’t come across it before). I agree with you about Elizabeth Bowen’s short stories – they seem to capture the absolute essence of the era; my personal favourite is ‘Mysterious Kor’, in which a girl and her lover wander around a moonlit blacked-out London. It’s a pleasure, Lissa. Hope you like Human Voices. That story by Elizabeth Bowen is extraordinary, I agree. One of my favourites, too. I found An Empty Death gripping – and was taken aback by the plot twist! I do love the Allingham. A very enjoyable post. 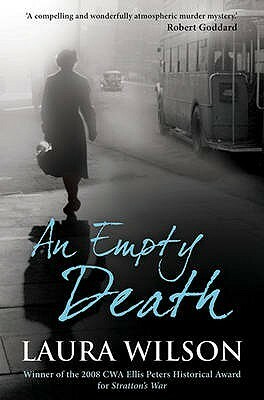 I would put in a word for A Deed without a Name by Dorothy Bowers, a talented writer who died far too young. Thanks, Martin. Moira and I are having so much fun that we have decided to share lists as a regular feature of our blog. Must try A Deed without a Name (good title! ).